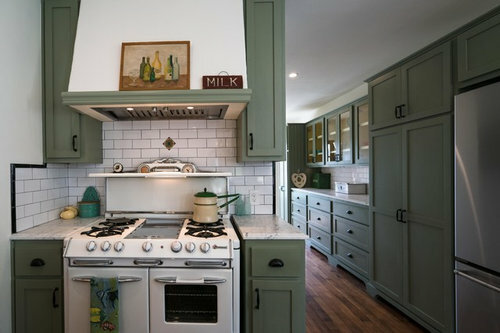 I love the green cabinets!! Would love to know what color they are. Hi Michelle! I'm glad you like them -- I have green cabinets in almost every house I do. These are based on Glidden Eucalyptus Tree -- from Home Depot. My painter copies that color to make the lacquer that the cabinets are painted with -- for that smooth finish.